Where should I put all my copied components in my Webflow account? TOP TIP: Make sure each folder you create has the same beginning e.g. 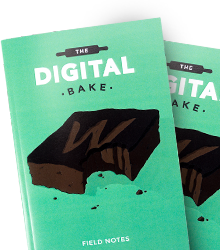 "Digital Bake..." or "DB..." that way the Webflow dashboard will keep them all grouped together. How do I use these components? You can visit the Webflow University for a video on how to use this feature, it's as simple as copying and pasting text! Why do you create and give these components away for free? That's a great question! You have me thinking now! Truth is I love designing this stuff, I love the Webflow community and Webflow as a whole. And it's not like I don't get anything out of this, I am a Webflow Affiliate so I make some money through that and also I use Digital Bake as a self promotional tool. So you get free stuff and I get work out of it, every one is a winner! Am I allowed to distribute your components myself? Kind of... I have a legal statement you can read, but the short answer is yes, feel free to send it to friends or colleagues, but I do have a caveat in there, that this license does not include the right to compile components from Digital Bake to replicate a similar or competing service.